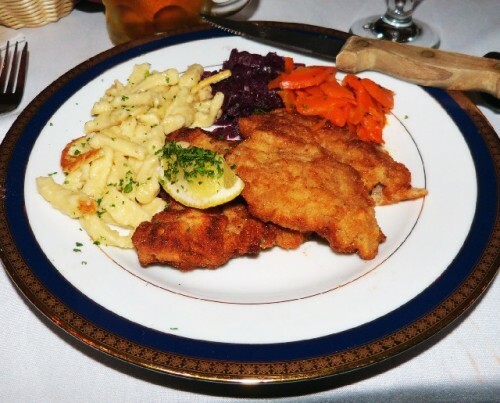 Halfinger Haus in Adams features Austrian cuisine. Giuliano photos. The classical revival mansion has changed hands several times in the past decade. 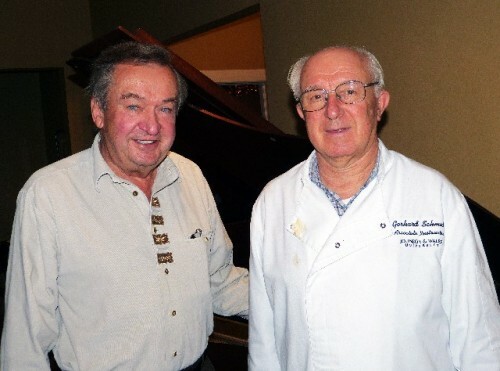 The owner Don Summer left and chef Gerhard Schmid. 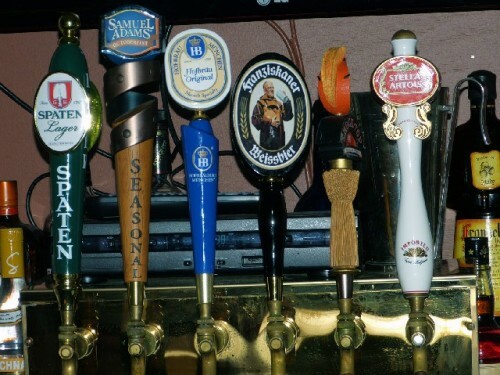 Beers on tap in the lively pub. 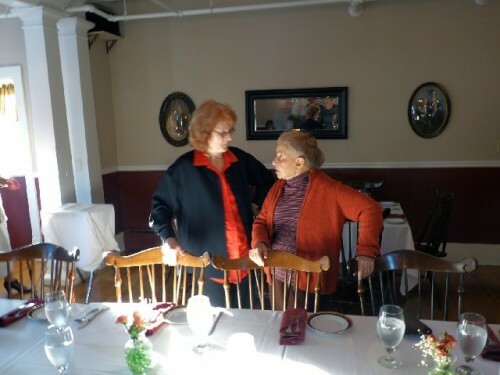 Astrid Hiemer, left, and Norma Leavey arrived early for the Octoberfest banquet. 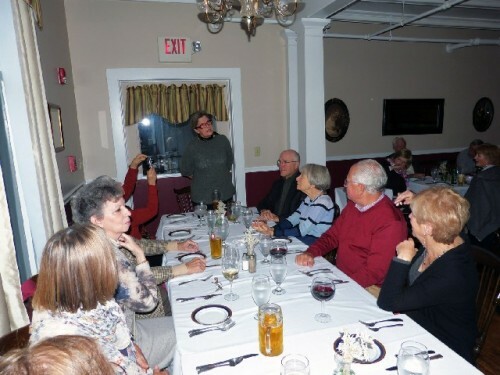 A toast for Octoberfest among Berkshire International Club members. 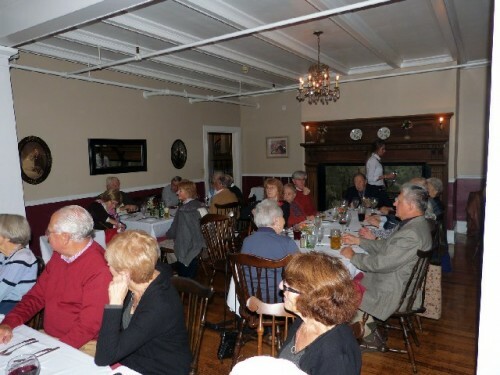 The main dining room was filled to capacity. A corner table by the window. Socializing before dinner was served. A piping hot cup of Fritattensuppe. A Schnitzel Holstein served at Gramercy Bistro in North Adams. Sauerbraten mit Rotkraut und Erdapfel Knodel. 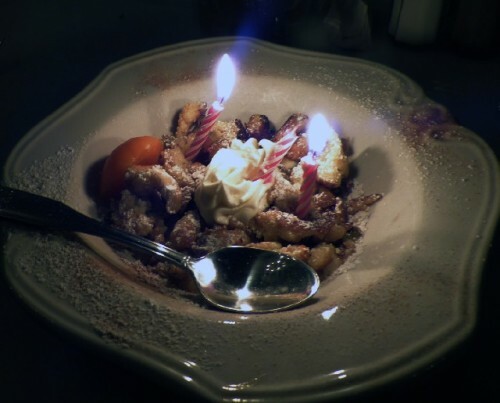 Kaiserschmarrn mit Aprikosen decorated with birthday candles. Chef Schmid greeting a room of pleased diners after his superb Ocboberfest banquet. 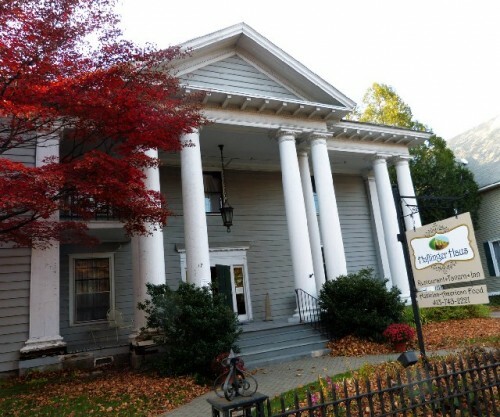 The elegant, classical revival mansion along the main route through Adams, Mass. has gone through several incarnations during the past decade. After acquired property in Adams we enjoyed evenings at Sylvia’s including spending a New Year’s Eve their celebrating with friends. She and subsequent owners couldn’t make a go of it. After the last owner there was media buzz that the landmark would be sold to a charter school or perhaps razed. 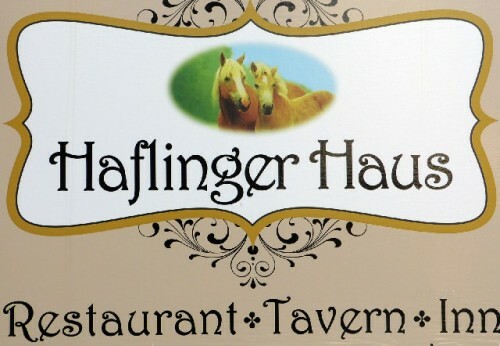 Last May we were delighted that the imperiled treasure would reopen as the Austrian themed restaurant Haflinger Haus. Astrid and I have much enjoyed dining in Germany and Austria so having this cuisine in our home town was terrifically exciting. Our initial visit, during the first week that the restaurant was open in May, however, proved to be a culinary and service disaster. The food we ordered was no where near the paradigm of our expectations. The service was miserable. We met and vented to the owner Don Summers who was getting his feet wet with his first restaurant. He revealed a passion for Austrian food which he was struggling to inspire in a young woman chef. While he insisted that the soup stock was made on site it was overly salty and surely came from a can. The schnitzel was deep fried instead of pan fried as is traditional. With an apology Summers discussed ambitious plans to renovate the structure and create a summer outdoor beer garden. While wishing him all the best it was unlikely that we would return any time soon. In an attempt to motivate the young and headstrong chef he brought in a renowned chef, Gerhard Schmid, as a consultant. 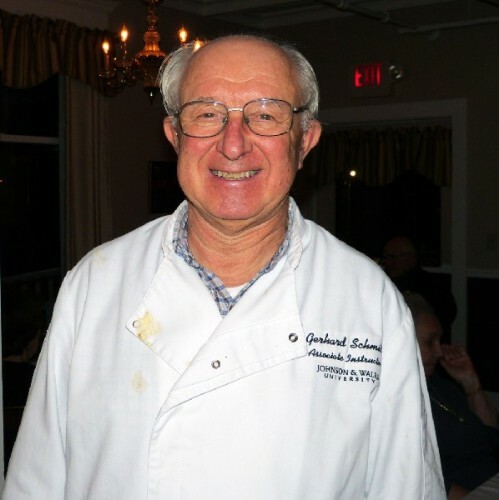 In a conversation this week, during our Octoberfest banquet for the Berkshire International Club, Summers revealed that the chef did not respond to Schmid’s advice. Fortunately, after letting the young chef go, Summers prevailed on Schmid to take over the kitchen. The change is spectacular. Summers told us that after just several months in business the restaurant is showing a profit. Although there are anecdotes from friends, and on line reports, that the food and service is not consistent. Most likely, that reflects that Schmid is not always on site. His function may be described as stabilizing the cuisine and training a staff in its preparation. He planned and prepared the special menu for our gathering and it was just terrific. Some time ago we were contacted by a club member to discuss a possible Octoberfest event. I suggested the restaurant and that a special menu might be negotiated. The menu was sent to members by a mail with a fixed price of $29. Initially, it seemed that the event might attract a dozen members or perhaps as many as twenty. The original suggestion of management was that dinner would be served in the smaller, informal room adjacent to the always lively bar. It offers German beers on tap and a special café menu. Astrid surprised me with the information that some 40 members had signed up for the banquet. Accordingly, we filled the elegant main dining room. 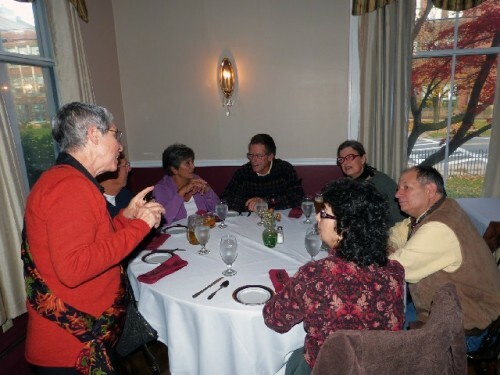 It appears that many guests were familiar with Chef Schmid and had enjoyed his renowned cuisine. After the dinner, when he entered the dining room, there were many warm greetings. His presence at Haflinger Haus proves to be a culinary coup. When he prepared a special Austrian themed event for the upscale Mezze restaurant they posted this profile of the chef. “Most renowned for his award-winning culinary career, Chef Schmid has been a distinguished visiting chef at the College of Culinary Arts at Johnson & Wales University where he taught classical French cuisine for eleven years. As a participant in the Culinary Olympics, he personally received three gold medals, one silver medal and, with the national team of four, won the Grand Gold Prize (first place) for the USA in 1968 against 21 nations. “Chef Schmid’s work has been awarded four stars by the Mobil Travel Guide and featured in many publications including Yankee Magazine, The Boston Globe, Boston Magazine, The Springfield Republican, Dallas Morning Star and numerous international travel books. 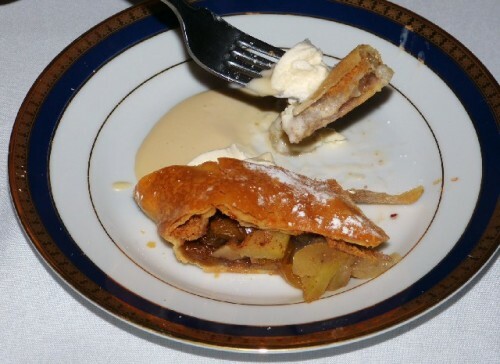 He has cooked for distinguished guests including Queen Elizabeth, Prince Phillip, the Shah of Iran and various American celebrities such as John Wayne, Steve McQueen, Norman Rockwell, Arthur Fiedler, Barry Manilow plus many famous Tanglewood musicians during his illustrious career. 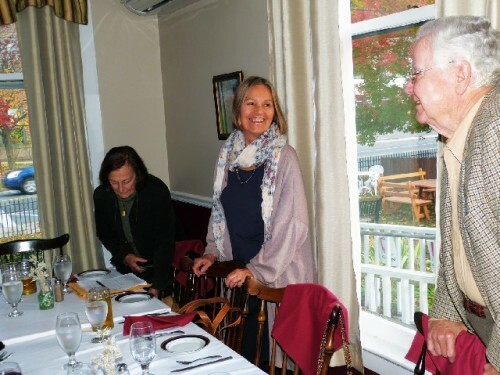 The encounter between forty members of the Berkshire International Club and the still relatively new restaurant proved to be a great challenge and opportunity. 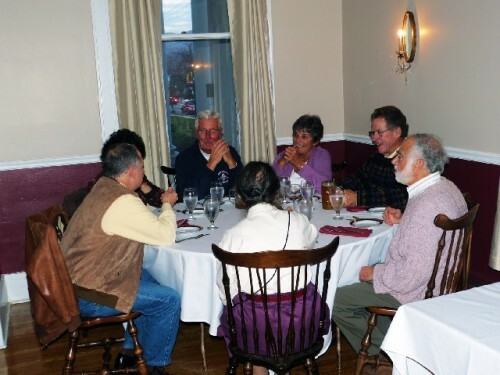 It was a sophisticated and discerning group familiar with Austrian cuisine and relatively difficult to please. Many members made a significant commitment traveling from South County to join in the festivities. Surely the resultant word of mouth buzz will be a win win. A number of members we spoke with stated that they will return. It will be fun to work through the menu of authentic dishes. I opted to start with the Fritattensuppe. 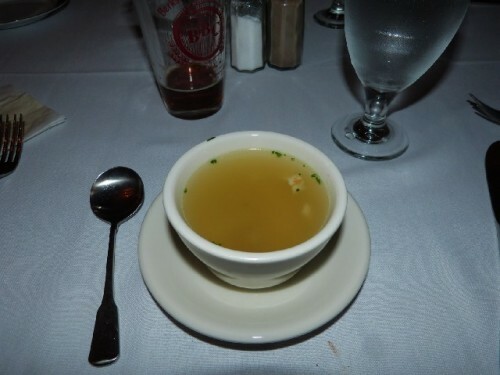 It was a fresh, clear chicken broth served piping hot with slices of crepes, chicken and a garnish of chives. 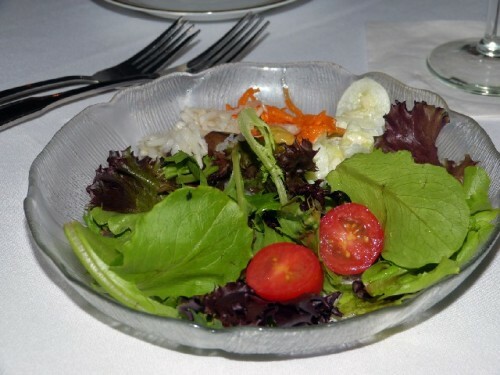 Astrid had the salad which she much enjoyed for its variety of fresh ingredients. For an entrée I tried a classic Wiener Schnitzel which is a true test for Eastern European cuisine. The pieces of veal were properly tender and lightly breaded then pan fried. They were accompanied by fresh made spaetzle and a garnish of vegetables. For a birthday celebration last year I ordered the Schnitzel Holstein at Gramercy Bistro at Mass MoCA. 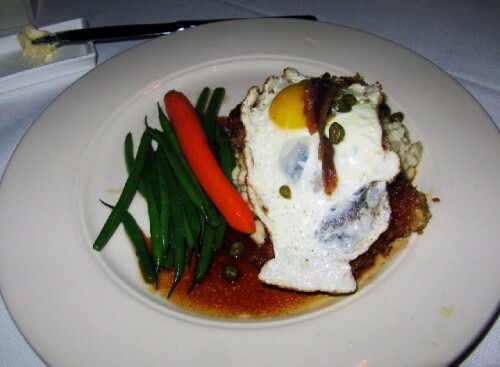 It was served with a fried egg over the veal and capers. It was interesting to contrast the different approaches. 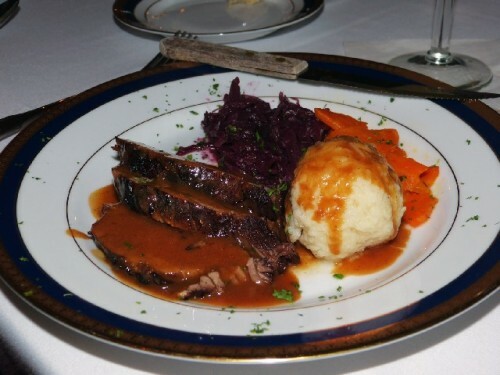 I sampled Astrid's Sauerbraten which was just delicious. The beef had been properly marinated with a vinegar flavor and tender, juicy meat. She also tried and much enjoyed my Wiener Schnitzel. As dessert we both chose Kaiserschmarrn with Aprikosen. It was described as an Emperor’s Omelet with stewed apricots. Mine came with three candles and a chorus of Happy Birthday. I thanked the members for coming to ‘my party.’ What a wonderful celebration. Overall, the banquet was an unqualified success. In fact, other that the annual spring and fall events hosted in the homes of members, this was among BIC’s best attended outside events. Once we were seated the food was delivered efficiently. Getting such a variety of dishes out on time was a real test of the kitchen. The wait staff could not have been more pleasant. 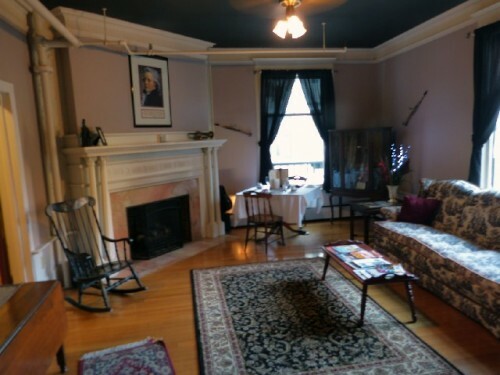 With the holiday season now approaching Berkshire groups may well be advised to have their gatherings at Halfinger Haus. Hopefully, the elegant mansion in Adams is finally coming into its full potential. How exciting to have this as our favorite local restaurant. Particularly, with the option to drop in and enjoy the pub menu for an informal evening with friends. "I miss Chef what isLillian and Chef doing now"
"Where is the great Chef now. Not only a great talent but an excellent person. I worked for him for two summers in the mid 80's ."